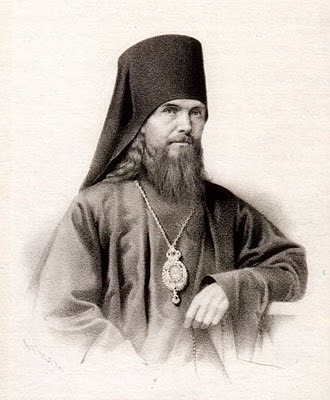 St Theophan the Recluse. Loving the hat. I once googled the Jesus Prayer and got a site somewhere out there that claimed this special, powerful, little prayer was essential for salvation, using a variety of Patristic and Byzantine quotations out of context. Since I do pray the Jesus Prayer, I am interested in what people have to say on the subject, but only the truth. I find the words of St Theophan realistic and true. One of the most important pieces of advice I read over breakfast one morning in Paris (and thus didn’t note the location in the volume) was the reminder that true prayer, that is, truly entering into mindfulness of God with our spirits/hearts, is entirely an act of grace; no technique will bring it to us — only God can. Nevertheless, we must continue working at prayer and mindfulness through the interior and exterior actions of life. The Jesus Prayer is like any other prayer. It is stronger than all other prayers only in virtue of the all-powerful Name of Jesus, Our Lord and Saviour. But it is necessary to invoke His Name with a full and unwavering faith — with a deep certainty that He is near, sees and hears, pays whole-hearted attention to our petition, and is ready to fulfil it and to grant what we seek. There is nothing to be ashamed of in such hope. If fulfilment is sometimes delayed, this may be because the petitioner is still not yet ready to receive what he asks. The Jesus Prayer is not some talisman. Its power comes from faith in the Lord, and from a deep union of the mind and heart with Him. With such a disposition, the invocation of the Lord’s Name becomes very effective in many ways. But a mere repetition of the words does not signify anything. *Ware and Palmer were also involved in project to translate the entire Philokalia; Ware with Mother Mary translated the Festal Menaion and Lenten Triodion. Of course, Ware’s work of bringing Orthodoxy to Anglophones goes beyond translations to his own writings, such as The Orthodox Way, The Orthodox Church, and The Power of the Name. In the fake news article, the Vineyard spokesman says that the point of the album was to help Christians get more intimate with God. And this is the point of all the ‘Jesus is my boyfriend’ worship and popular songs — to express or help facilitate an intimacy with the living, Triune, eternal, immutable, just, holy God. And we need a bit of help with that, because the idea of entering into close communion with a consubstantially united triad of persons Whose Being is Communion can, quite frankly, seem a bit daunting at times. Why are we corporately expressing personal intimacy that not all of us can hope to share? That is to say, the sentiments of a John Donne or a John of the Cross or a Lady Julian of Norwich or a Teresa of Ávila are valid expressions of Christian piety, and often sound to our ears like ‘Jesus is my boyfriend’. But none of these is the liturgical, corporate aspect of Christian devotion. These intense emotions, these expressions and outpourings of love to the Almighty are the personal devotions of these particular individuals. They were written down as aids for us, to be sure. And some of them we can even use individually as we gather corporately. But what if I’m not feeling today like Jesus’ touch is all I need? What if Jesus isn’t all I’ve ever needed? Like, some of us eat, after all. What if Jesus isn’t all I want? Sometimes I want Star Trek. Sometimes I want pizza. These songs make liars out of us. They also keep our corporate worship life at an emotional fever-pitch that is unmaintainable, and when people start wanting Star Trek or pizza or their spouse or a dog or anything other or, as happens, more than Jesus, and this recurs time and again, they feel themselves unspiritual and throw in the towel. Now, Jesus should be what we want most. And he is what we need most. But expressing what should be but is not through emotionally manipulative, fast-paced music is not the way to help us find true intimacy with God. And to help us realise the latter truth of what is but which we often forget to be the case, we need robust theology as well as catchy tunes. In Matthew 6:6, Jesus tells us to go into our secret place and the shut the door when we pray. This prayer cupboard (or icon corner, if you’re into that kind of thing) is where we must engage in the hard, long task of moving into the deep, loving intimacy of the Triune God. This is a task of the inner person, and it is a daily task of labour and love, not a weekly task of easy emotions and cheap thrills. The inner has been placed in the outer in modern worship. The new song writers must help us retreat back into our hearts as they give us the outer expressions of true theological hymnody that sings the glory and praises of the Triune God in all his majesty. And when we come away from these heady experiences, we can sit quietly in our room and hope with our inner expressions to meet with the living God, who powerfully comes quietly. NB: I would also put dubious hymns based on Lady Julian of Norwich’s feminine imagery for God in the same category of ‘Jesus is my boyfriend’ — useful for the theologically-informed in their prayer closet, but not for Sunday morning. March 1, 2013 MJH Books, Christianity, Classic Christianity, Eastern Orthodoxy, Monks	christian spirituality, christianity and eastern religions, contemplation, devotional classics, edith m humphrey, kallistos ware, mysticism, richard foster, spirituality, why stay a christian? I have talked with some other ‘young people’ who were raised in the Church who have found that the sort of Christianity we put on offer at our local congregations and in many popular books is merely intellectual(ist) or emotional(ist) or sometimes both. But what about a religion or faith or spirituality that touches the deep chasms of the human soul, the vast interior world of the human heart, itself an image of the infinite simplicity of the Triune God? What about that kind of living, believing, thinking? When this sort of disillusionment hits, different people take different approaches. One friend struck out into the land of the chemical — MDMA and marijuana led the way to cocaine (and who knows what else). Another friend went the much safer (at least physically) route of exploring Hinduism. Another friend I know has taken an interest in Islamic Sufism. The drug-free path or a version thereof, from what the Interwebs shows me, seems to be a popular journey for a lot of young people raised in the Church. At some point, what’s being fed to our young congregants ceases to satisfy, so people start hunting for nourishment wherever it is to be found. Jesus Christ is the logos who orders the entire cosmos, who undergirds everything. He is the Reason of God, and each of us, made in God’s image, shares in that Reason. He can draw us all up to himself. The exitus from God has happened in every human heart, and not every guide on the reditus need be a Christian. I have profited from the Stoics. But we need not look beyond the community of the faithful to find reliable guides on the spiritual journey. My general concern about Christians who become more interested in any philosophy beyond the Faith is whether they will still cling to Jesus and the Trinitarian Faith in the long run. And if we are dissatisfied with what we’re being served, we can explore the depths and riches of the interior world — enter the rooms of the Interior Castle — from within the Christian tradition. This blog is mostly about those who have already made the reditus and have entered the everlasting rest — of every age, the contemplatives, mystics, ascetics, prayer-warriors, meditators, theologoi. I am prone to pulling in John Cassian and the Desert Fathers and Mothers as well as St Francis of Assisi, but other guides for this journey to make an appearance have included St Anselm, St Bernard of Clairvaux, Lady Julian of Norwich, St Gregory Palamas, St Teresa of Ávila, St John of the Cross, William Law, and John Wesley amongst many others. But often, the problem with these spiritual masters of the past for one wishing to sail out into the sea of the interior world is the fact that simply reading them is itself a discipline — and very often it is difficult to apply their lessons to our lives. Or no visible, practical lessons seem to be forthcoming. So where do we go for guides to the spiritual world? The church does not have a shortage of spiritual guides today, we just don’t always know where to look. I encourage you, if you are disillusioned with the shallowness, intellectualism, and/or emotionalism of your church today, before giving into accedia and going elsewhere, try to deepen your own walk first — perhaps a deeper connexion with Christ will deepen your appreciation of your own church. Richard Foster. Start with his most famous book Celebration of Discipline. Foster ranges far and wide across the Christian tradition, bringing in ancient, mediaeval, and modern, Roman Catholic, Eastern Orthodox, his fellow Quakers, Anglicans, Baptists, and so on. Here you will get descriptions and practical tips on how to enter into the love of God and actually live for Him, being transformed, through twelve disciplines: meditation, prayer, fasting, study, simplicity, solitude, submission, service, confession, worship, guidance, and celebration. This is one of the most-purchased and least-read books out there — and, I think, even less applied than read! His book Prayer: Finding the Heart’s True Home helped sustain me while I was a missionary in Cyprus. Kallistos Ware (Timothy). Foster is probably the most practical guide to the spiritual life I’ve encountered. But Ware’s works, especially The Orthodox Way but also, to some extent, The Orthodox Church, are excellent avenues into the world of Eastern Orthodox spiritual paths and spiritual thinking. He lacks the aggressive anti-western aspects of certain other writers on similar topics (e.g. Lossky, Romanides), but presents so appealing an image of Orthodoxy that you want a taste of that inner world, even if you are hesitant of joining him for doctrinal reasons. Ecstasy and Intimacy: When the Holy Spirit Meets the Human Spirit. In this book, Humphrey investigates what she calls ‘spiritual theology’, looking at Scripture as well as those who have gone before (tradition as it is lived, I suppose) and at her own lived experiences as a Christian. She wrote while still an Anglican, but the influences of the Eastern church are visible. If you read any of these, hopefully a few things will happen: You will be drawn deeper into the Father’s embrace and delight more and more in the self-giving love of the Most Holy Trinity. You will pray and meditate more. You will read Scripture with fresh eyes. And you will start to read more of the masters in full, starting with such classics as St. Augustine’s Confessions (in Chadwick’s translation for Oxford World’s Classics, not Pine-Coffin’s for Penguin Classics!) and Thomas a Kempis’ The Imitation of Christ and maybe popping in on more recent spiritual guides such as Merton’s The Inner Experience. And, having started to read the masters in full, may you be drawn deeper into the Father’s embrace and delight more and more in the self-giving love of the Most Holy Trinity, pray and meditate more, and read Scripture with fresh eyes. Last night after Bible study, I was talking about my tutorial for tomorrow with one of the guys, a tutorial about the Desert Father St Antony of Egypt (saint of the week here). Like many evangelicals, my friend sees no appeal in monasticism, rightly (I believe) criticising the all-too-frequent tendency in monastic or eremitic circles to cut oneself off from the rest of the world that the commandments of Christ to make disciples cannot be fulfilled. I, however, tend to find the monastic call somewhat appealing — certainly the ascetic/mystical call. When we look at St Francis (as at Antony), we see someone who took up the ascetic life out of a desire to live in radical obedience to Jesus. He gave away his very clothes so as not to be beholden to his earthly father, declaring to his local bishop that he now had only God for his Father! And what does Francis do? He goes and rebuilds a local church. And then he gathers a band of fellow jongleurs de Dieu. And what do they do? They go around getting into all sorts of trouble and preaching the Good News of Christ. This is the monastic impulse as it should be, I think. The single-minded devotion to Christ that we find in ascetics from Antony of Egypt to Benedict of Nursia (saint of the week here and here) to Bernard of Clairvaux (saint of the week here) is present in St Francis of Assisi. He abandons the life of a warrior or of a middle-class merchant with wealth. Rather than giving the regulated, required tithe to the poor, he gives all to the poor and joins their ranks, out of obedience to Christ’s call to give all your possessions to the poor. St Francis spent hours and days and months in prayer, once going off to an island spontaneously and spending all of Lent on it praying. This is the monastic impulse at work. But St Francis takes this single-mindedness and turns it outward to the suffering world around him. Francis doesn’t shut himself away in a cave or the thick walls of an Italian monastery. He goes out into the world, preaching the Gospel of Christ, working to save souls. This is the monastic impulse as it should be directed, I think. He engages in the usual ascetic practices of dietary restriction, prayer, and poverty, but he spends his days in the marketplaces of Italy, telling people the Good News of salvation in Jesus Christ, calling them to repentance. The Franciscan friary — their equivalent of a monastery — is meant to be a stop along the way, a place for refreshment both physical and spiritual before going back out into the hostile world and engaging in the true mission of Francis: winning souls for Christ. It all sounds terribly evangelical, doesn’t it? *Also, I’ve written these blog posts: St Francis and Why You Like Him; The San Damiano Crucifix; Saint of the Week: St Francis; St. Francis of Assisi; What to Do with the Canticle of Brother Sun; and St Clare’s Laudable Exchange. First, pop on over to this website and read the “Canticle of Brother Sun”. It is a supremely characteristic work and much of Saint Francis could be reconstructed from that work alone. St. Francis of Assisi was an orthodox Catholic believer. His goal was not to start his own hippie church (contra Donovan & Brother Sun, Sister Moon). His goal was to bring the true faith to the common people of Italy, to bring people to true faith and hearty repentance, to cause the rich to reconsider the value of wealth, to give strength the poor — and all of these things are not done through Brother Sun but through our Lord and Saviour Jesus Christ. St. Francis was aware of this. It permeates the majority of his life, the stories of his life, and his writings. And if we look at the “Canticle of Brother Sun,” we see that it balances all the words about creation with praise of the Creator. This is the balance that must be found when we discuss eco-theology or the greening of theology or a theology of the environment or creation care. The centre of our worship must always, ever, and ceaselessly be our Lord God. And through our own fault we have fallen. through Whom You have done such great things for us. Let us all love the Lord God with all our heart, all our soul, all our mind, and all our strength [cf. Mark 12:30], with fortitude and with total understanding, with all of our powers, and with every effort, every affection, every emotion, every desire, and every wish. He has given and gives to each one of us our whole body, our whole soul, and our whole life. He created and redeemed us, and will save us by His mercy alone. He did and does every good thing for us who are miserable and wretched, rotten and foul-smelling, ungrateful and evil. of all the blessed who rejoice together in heaven. or nothing come between us. This is the heart of Franciscan spirituality.